The TSA Educational Scholarship Program was established in 2016. 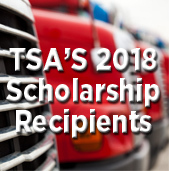 It provides scholarships and grants to help fund post-secondary education – college or trade school – for TSA members and their dependents. Applications for the 2019/2020 school year are available now!. Learn more. PrePass Weigh Station Bypass: TSA Members get your first 2 months free! Save Time, Save Fuel, Save Money! with PrePass. Learn more.